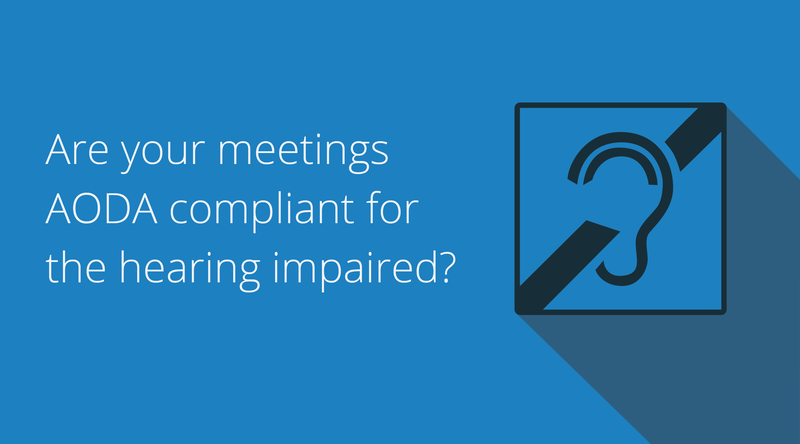 Are Your Meetings AODA Compliant for the Hearing Impaired? Canada has a culture of inclusiveness, and it’s one of the things that makes it a great place to live. Canada legislates provisions like ramp access for buildings to accommodate those in wheelchairs. Guide dogs are allowed access anywhere. Everyone should be able access to all things. In Ontario, the legislation is written into the Accessibility for Ontarians with Disabilities Act (AODA), passed in 2005. It aims to make Ontario fully accessible by 2025. As part of this goal, it mandates that all public sector organizations and any private or not-for-profit organizations of 50+ employees be fully listening-assistive by the end of 2015. Smaller companies and NFPs need to be compliant by the end of 2016. All organizations and corporations, public or private, need to know and follow AODA compliance. It’s the law – and it’s the right thing to do. Certain provisions coming into place in Ontario for the hearing impaired in public spaces within the next year. There are more than a million people living in Canada that have some degree of hearing loss today. Add to that the fact we have an aging population. With 40% of Canadian adults over 75 having a significant hearing problem, these provisions represent some serious forethought by policy-makers in this country. At the risk of sounding like an old person myself, rates of hearing impairment are also on the rise amongst Canada’s youth. They call it “noise-induced” hearing loss, because of all that blasted “music” they’re listening to. Let’s say you’re hosting a lecture for a full classroom and connecting via video conference to even more students. Did you know that it’s likely you’d have to be AODA compliant in this situation? 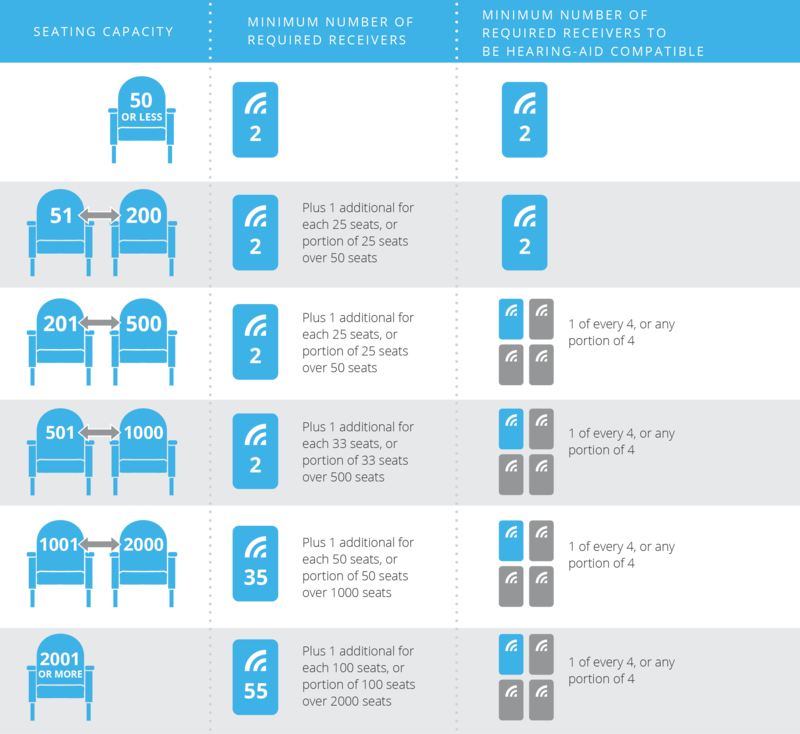 Article 3.8.3.7: In buildings of assembly occupancy, all classrooms, auditoria, meeting rooms, and theatres with an area of more than 100 m2 and an occupant load of more than 75 shall be equipped with assistive listening systems encompassing the entire seating area. Except as otherwise provided, every organization shall upon request provide or arrange for the provision of accessible formats and communication supports for persons with disabilities, in a timely manner that takes into account the persons accessibility needs due to disability: and at a cost that is no more than the regular cost charge to other persons. The obligated organization shall consult that person making the request in the determining the suitability of an accessible format or communication support. Every obligated organization shall notify the public about the availability of accessible formats and communications supports. You need to have a system in place and be ready to accommodate any individual requesting assistive listening support. And you need to have signs that indicate that such support is readily available. Here’s a terrific resource: the good people at Listen Technologies have created an online calculator to help you figure out exactly what your space requires. It’s based on the American ADA requirements, but it’s very closely followed by Canadian standards. There are three types of assistive listening systems: radio frequency (RF), Infrared (IR), and induction loop (hearing loop). Each of these systems uses different technology to transmit sound to a personal receiver or t-coil equipped hearing aid. So this is a great system to comply cost-effectively, but can be picked up by those not in the audience if they have a receiver. If security is a factor in your decision, it’s worth looking at the IR system. These are more expensive, but you’ll never need to worry about the audio making it outside the room. High security. Now, both of the above systems require the participant to wear a receiver around their neck, which may potentially make them self-conscious (and the goal is inclusiveness, after all). The Loop system, described below, eliminates the receiver if the participant has t-coil equipped hearing aid or cochlear implant. For organization bent on creating the best experience for all people involved, the hearing loop is the best option. There are no visible receivers necessary for those who have a t-coil (though receivers are available for those without). These deadline dates to comply with AODA legislation are coming soon – if you haven’t yet, now is the time to start looking at assistive listening systems. With hearing loss on the rise in Canada, organizations will be looked to accommodate. It’s the right thing to do, and you’ll be considered a thought leader for doing it right. Want to learn more? There’s a free Assistive Listening and ADA Compliance online session and course, designed to share and inform about all things assistive listening. Again – these are based on US requirements, but there is a lot of overlap. Worth a listen!